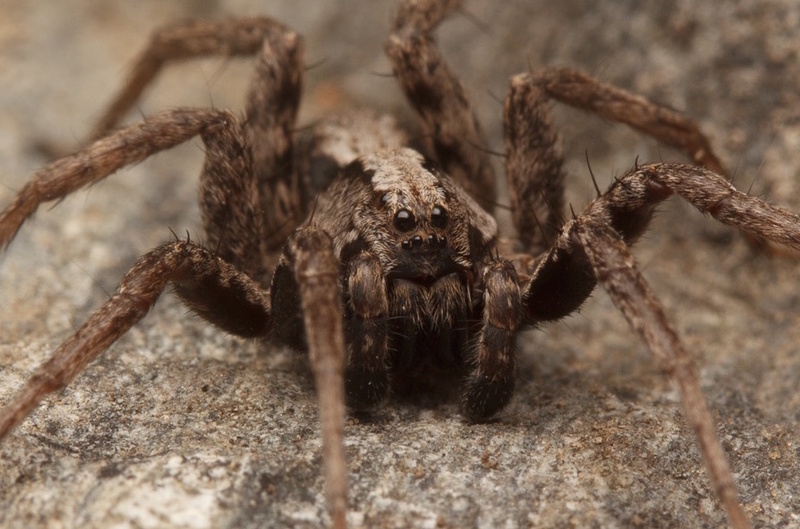 Did you ever come across one of the most beautiful wolf spiders you’ve ever seen, only to realize that it’s not a wolf spider at all, because the eyes are all wrong? And if it’s not a wolf spider then what the heck is it because it doesn’t look like a spider from any of the other spider families you’re familiar with? No? Well, I had this experience recently. Twice, actually. The first time it happened was during our epic journey from Toronto to southern Texas to California and then to Victoria (also known as #SpiderTrip2016 – check out some of the great photos Sean took along the way here). We stopped one morning in Joshua Tree National Park and flipped over some rocks to see if we could find any insects or spiders hiding underneath. Almost immediately, I uncovered this gorgeous spider with perfect desert camouflage. Not a wolf spider. Photo: Sean McCann. The bold markings reminded me a bit of some funnel-web weavers in the family Agelenidae, but this spider didn’t have a web. Agelenopsis aperta (family Agelenidae, the funnel-web weavers). 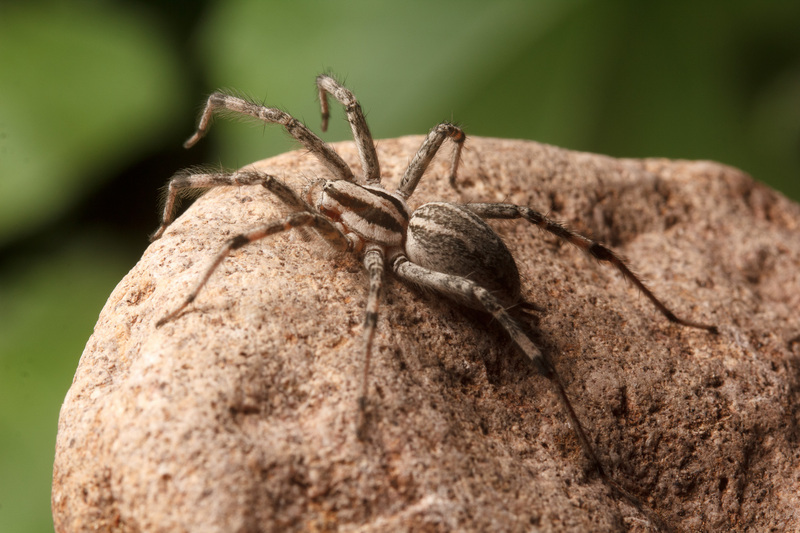 Yeah, this spider isn’t on a web either, but that’s because we put it on a rock to get a good photograph of it. Agelenids are usually pretty camera-shy, and they like to hide in their retreats. Photo: Sean McCann. 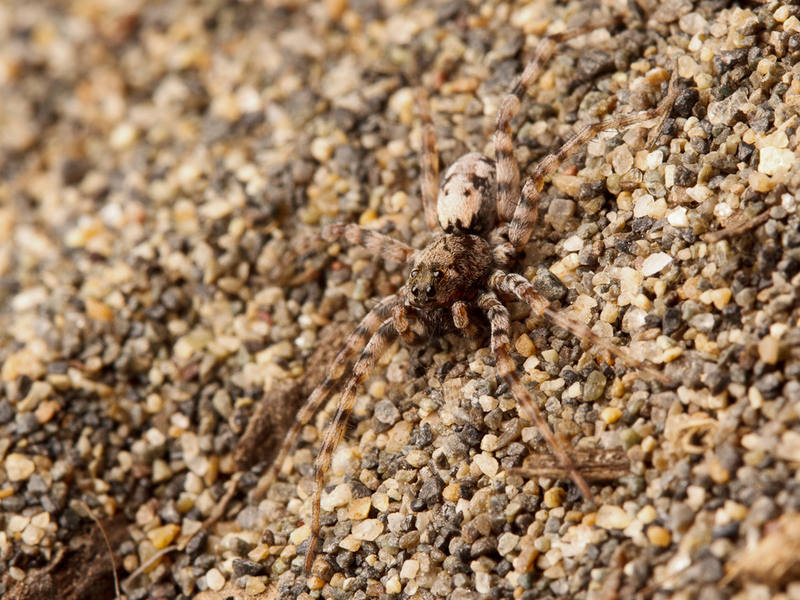 The sandy camouflage was similar to that of the beach-dwelling wolf spider Arctosa perita, but on closer inspection I realized the eyes were all wrong for it to be a lycosid. 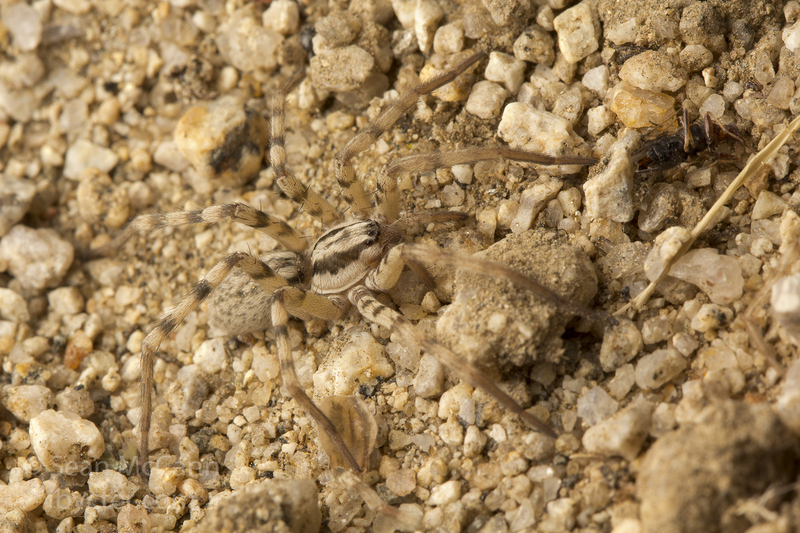 Arctosa perita, with characteristic wolf spider eye arrangement. Photo: Sean McCann. 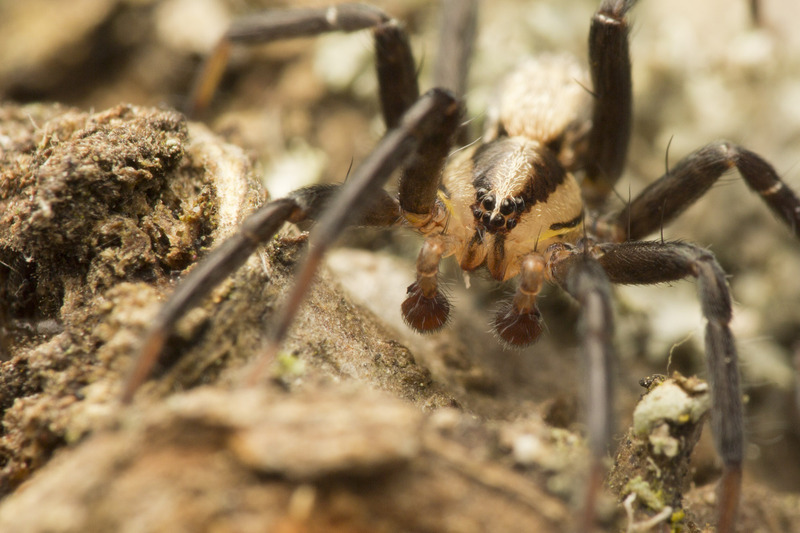 The key to figuring out whether or not you’ve got a wolf spider is the eye arrangement. Lycosids are visual hunters that have their eyes arranged in three rows. 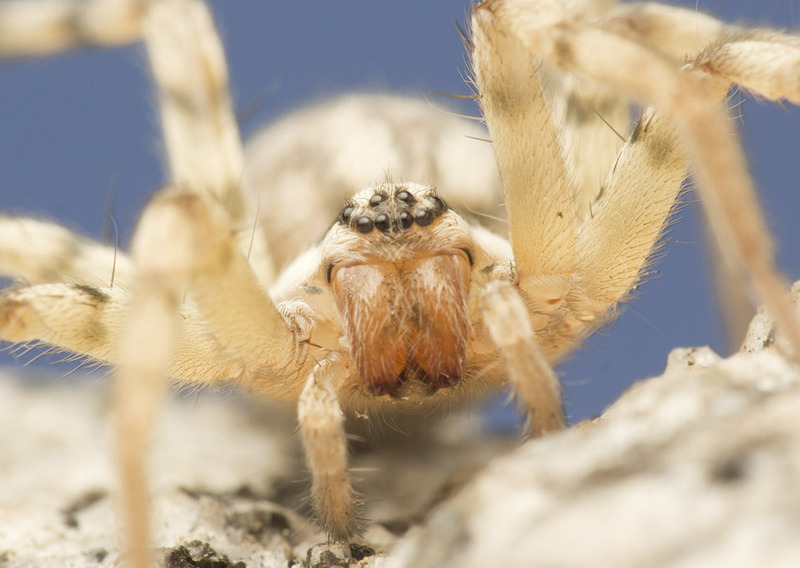 The first row has four small eyes, the second has two large forward-facing eyes, and the third has another pair of slightly smaller eyes quite far back on the cephalothorax. From straight on, they may appear to have only 6 eyes (the first two rows). Wolf spider (family Lycosidae) eye arrangement. Photo: Sean McCann. 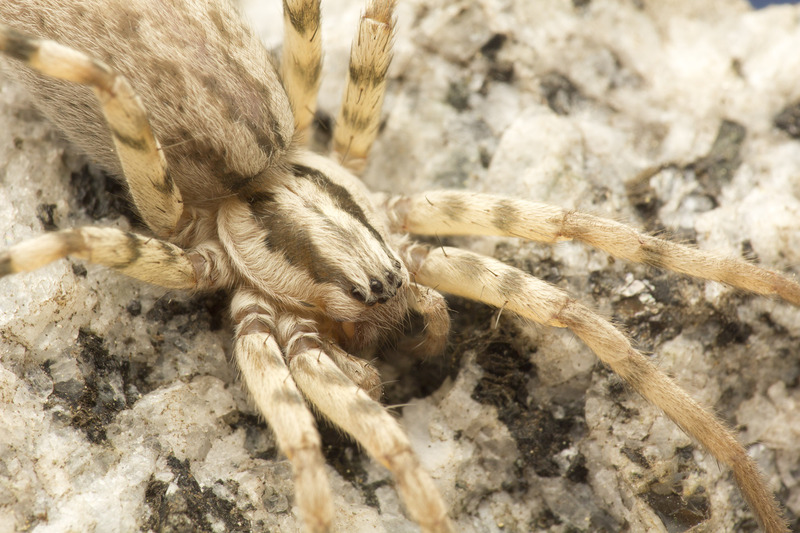 Syspira is clearly not a wolf spider – it has two rows of four eyes (or if you like, a smiley face eye arrangement – once you see it, you won’t be able to un-see it!) that are all pretty similar in size. From above, the eyes appear to be arranged in two more or less straight rows. I never would have guessed by looking at it that this spider is in fact a prowling spider in the family Miturgidae. When I think of miturgids, the first thing that comes to mind are the long-legged sac spiders in the genus Cheiracanthium. Cheiracanthium sp. 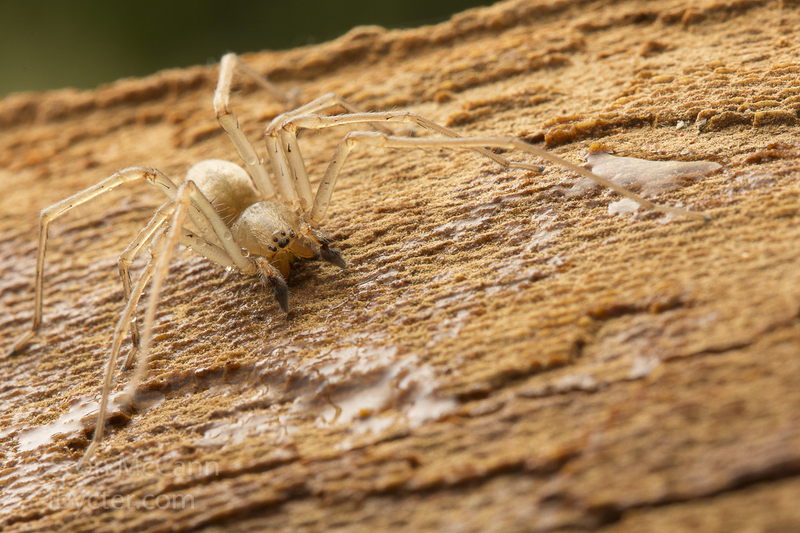 – a yellow sac spider in the family Eutichuridae (formerly placed in Miturgidae, and before that, Clubionidae – spider systematics is complicated and constantly changing). Photo: Sean McCann. Immature Syspira sp. (family Miturgidae, also known as the prowling spiders). Photo: Marshal Hedin. Licensed under CC BY-SA 2.0. That’s it! That’s our spider! Not only does it look pretty much identical, but it was found in the very same desert where we found ours. Syspira! The trail goes cold here, however. I can’t say for sure what species it is because the most recent revision of the genus is an unpublished thesis that I can’t get my hands on at the moment (for what it’s worth, I suspect Syspira tigrina). And very little is known about the natural history of these spiders. They are nocturnal wandering hunters who hunker down under rocks or other objects during the heat of the day. They are a pretty good size – the body length (combined length of the two body segments) of the individual we found is probably about 15 mm. Female Syspira sp. Photo: Sean McCann. 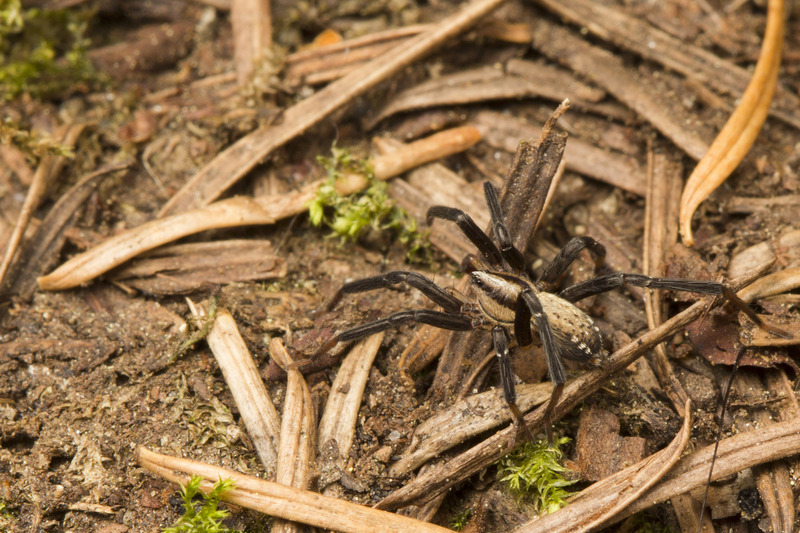 Our second wolf-like spider is a much smaller critter (less than 5 mm in body length) that we found wandering the forest floor while we were hiking at Mount Work on southern Vancouver Island this past weekend. Wolf-like spider from Mount Work. Photo: Sean McCann. 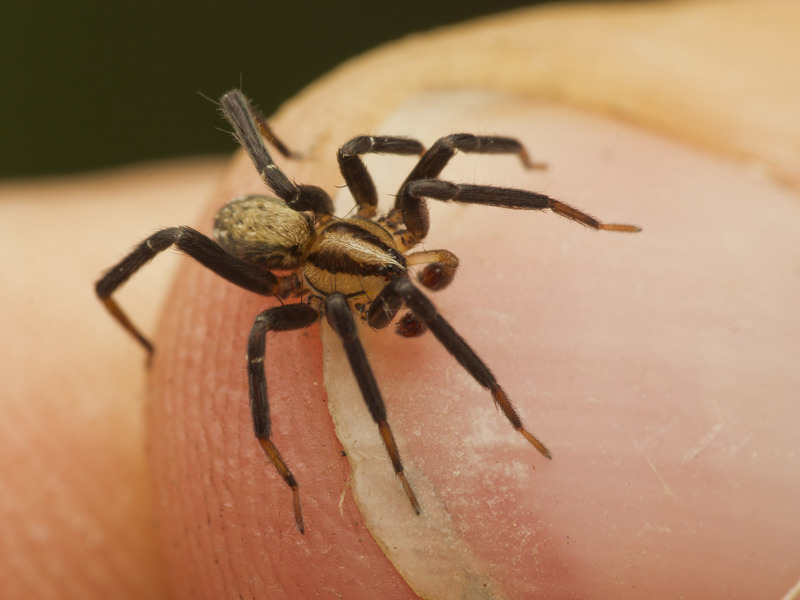 This photo shows how tiny this spider is relative to Sean’s thumbnail. Photo: Sean McCann. This little guy definitely had us thinking he was a wolf spider until we took a closer look at his eyes. The eye pattern is sort of similar to that of a lycosid, but I only see two rows of four eyes rather than three distinct rows, and the middle two eyes in the second row (called the posterior median eyes if you want to be technical) are too close together. This eye arrangement is more similar to that of ctenids (wandering spiders, which we don’t have in Canada) or pisaurids (nursery web spiders and fishing spiders). Eye arrangement of our mystery spider. Photo: Sean McCann. I guessed that this might be Zora hespera (another miturgid!) based on a drawing of a similar tiny spider in our field guide, and our friend and arachnological guru Robb Bennett quickly confirmed the guess. As it turns out, this species was only described in 1991, and Robb first documented its presence in British Columbia in 1996. Adult male Zora hespera (Miturgidae). Photo: Sean McCann. The genus Zora used to be in the family Zoridae, which no longer exists (if you use the excellent Field Guide to the Spiders of California, however, you’ll still find Zora hespera listed as a zorid). The name Zora is also new – the genus was originally called Lycaena (which means female wolf) because of its similarity to wolf spiders, but the name had to be replaced because it was already being used for a butterfly genus. 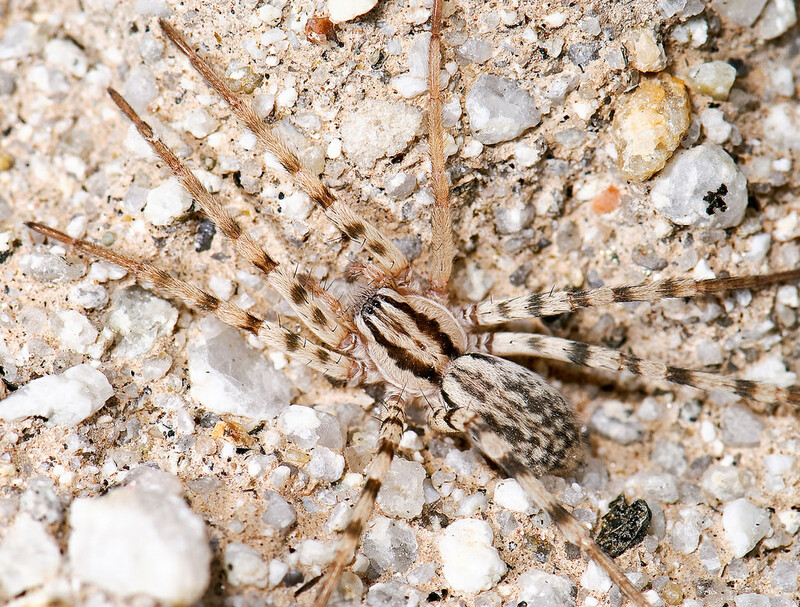 These spiders hunt on the ground and low vegetation during the day and are most often found in open sunny areas of wooded or disturbed habitats. Adult male Zora hespera. Note how small he is relative to the pine needles! He was pretty cryptic against the forest floor. Photo: Sean McCann. 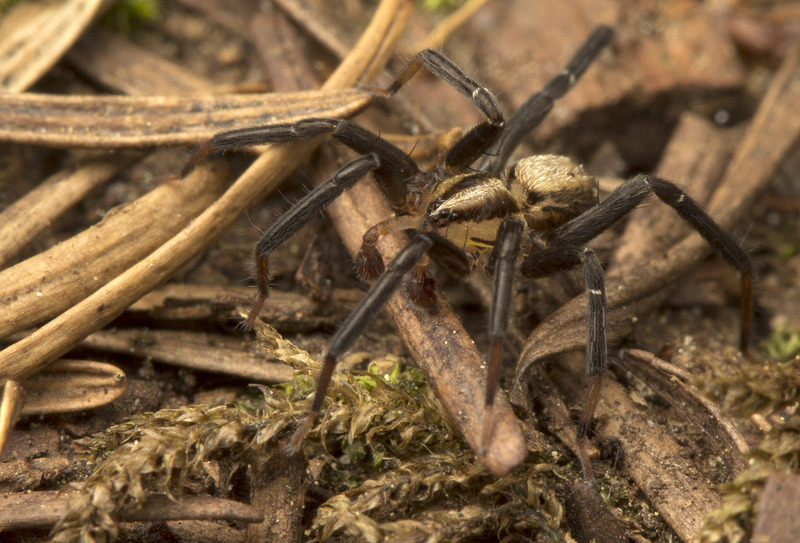 The individual we found prowling the forest floor is a male (you can tell by the enlarged pedipalps) who may have been on the hunt for a female. Courtship in this species is brief and includes a leg-waving display on the part of the male. 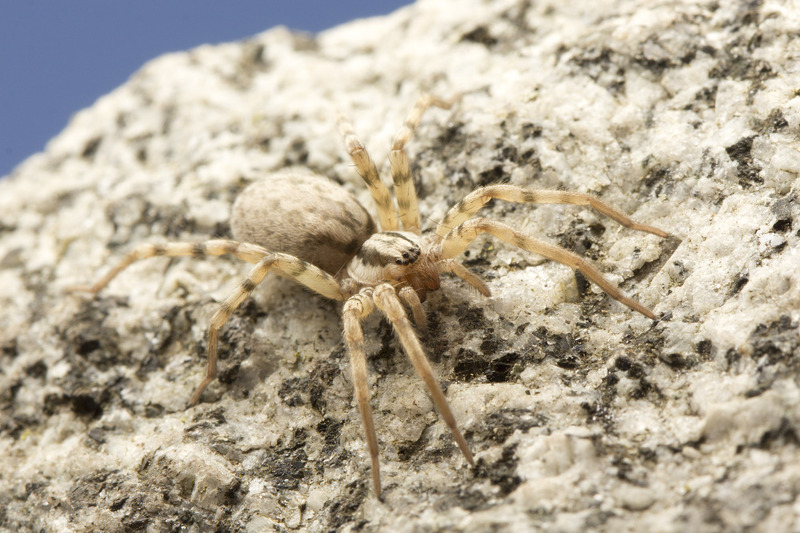 Once mated, the female produces an egg sac that she attaches to the underside of a rock or other object. A flat sheet of silk hides the egg sac and the female stands guard to protect her offspring from predators and parasites. Syspira sp. looking cryptic on the desert sand. Photo: Sean McCann. Spider identification can be tricky! 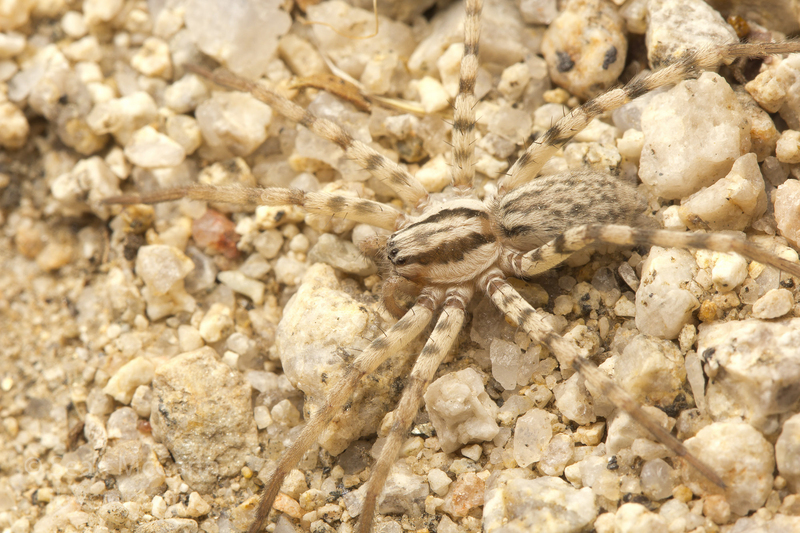 Next time you think you’ve found a wolf spider, take a closer look – it might be a wolf-like prowling spider, or something else altogether! The more time I spend learning about spiders, the more amazed I am by their beauty and diversity. Ubick, D., Paquin, P., Cushing, P., & Roth, V. (2005). 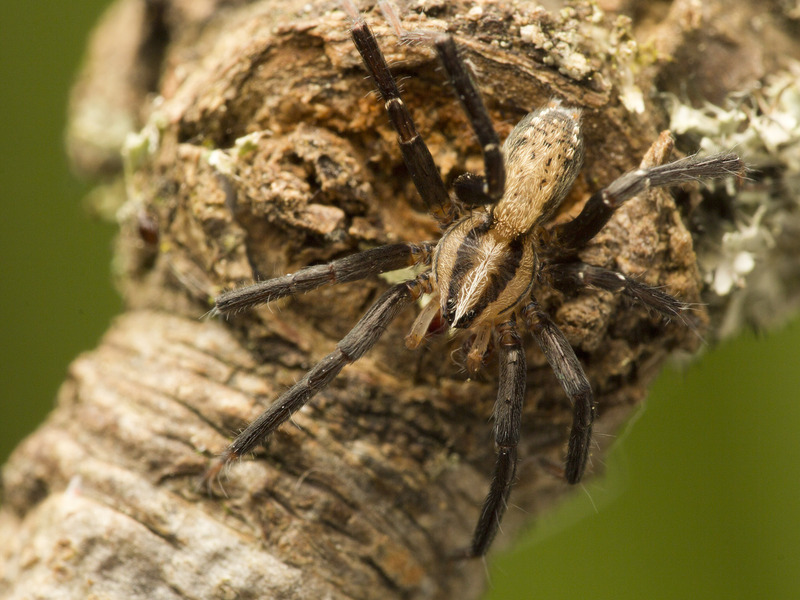 Spiders of North America – an identification manual. American Arachnological Society.